New designs have been unveiled for a $70 million project will be located on the 400 block of West Superior Street in Downtown Duluth. The project, designed by RSP Architects, had no formal name prior today's unveiling but now will be referred to as simply "Maurice's Headquarters." The building will stand 11 stories tall, 4 shorter than the 15 story structure that was originally planned. The project has also been downsized in square footage, down to 200,000 square feet of space from the 300,000 originally planned. 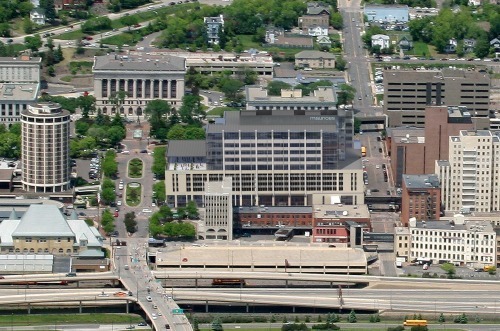 Maurice's will occupy the upper floors, with levels three through six housing a 500 space parking ramp that will be owned by the city of Duluth. 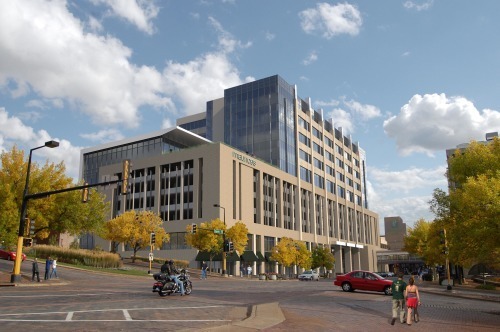 The street level will be home to retail space and one of those spaces will be home to National Bank of Commerce's new branch office; they'll move a few blocks from down the road when the space is ready in 2015. The additional retail space has yet to be committed to. It however will not be home to a Maurice's store as originally rumored, but rather a coffee shop and restaurant are hoped to fill some of the space.